Once you go raft, you never want to go back! Having a professional guide tour you around the beautiful boundary waters on an outfitted trip is more than just a once in a lifetime experience. Whether you are looking for an All-Inclusive Outfitting Option or even a Partial Canoe Outfitting. Our high quality outfitted canoes and equipment will keep up with you during your solo, or group traveling canoe trip. Become one with the earth as you glide across Farm Lake or into one of the many other entry points to the legendary Boundary Waters fishing holes. Catch massive bass or relax by the warm campfire surrounded by majestic sky as the stars shine for you. 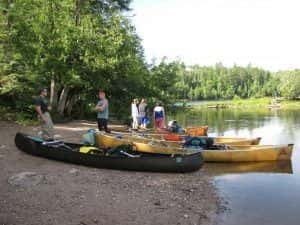 Choosing a professional camping and canoeing outfitter near Ely Minnesota will give your experience the best chance for success because you will be fully prepared. We can help with mapping, entry, shuttle and can be a resource for much more. It is a massive world out there, come up to Moose Track Adventures and get connected with a part of it! We have an assortment of other rentable equipment here at Moose Track Adventures. Whether you need a campground or luxurious lakeside cabin, our housing is not only fair but extremely homey and inviting. Give us a call when you are ready to set up your boundary waters canoe outfitter experience at 218-365-4106! You will have the time of your life, with many stories to tell when you get home… if you ever decide to go back there!